European equities are set to ease on the open, dragged lower by US earnings. Even though we saw a good day for spread betting markets in Europe, Wall Street simply bobbed around unchanged. Early on in the US session, corporate earnings had continued to surprise to the upside, pushing equities higher. Following this, disappointing new home sales figures raised concerns about weakness in the housing market and highlighted the mixed picture presented by recent economic data. This meant that the Dow reversed its initial rise to finish flat for the day. However, after-hours results from Amazon saw US index futures sell off and this will weigh on today's open. We are expecting stock markets in Europe to edge lower this morning. Despite a positive finish yesterday and a surprisingly strong HSBC PMI out of China overnight, sentiment remains cautious. Equities may have been buoyed by Europe's lack of cohesive action over Russia, but today sees the European Commission debate the tougher economic sanctions that were mentioned at Tuesday's Foreign Ministers meeting. Expectations are that they will stay true to form and do nothing, but traders are on standby as there is always the possibility that international pressure may spur some surprise action. 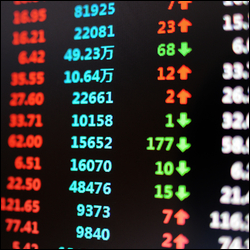 The Dow Jones ended slightly lower at 17,088 last night following a sharp fall for Boeing, one of the top constituents. The aviation stock's weak results were a surprise as the general tone of corporate earnings has been positive, especially in conjunction with signs that inflation has been kept on a short leash. However, investors are clearly unconvinced as they have pushed the Dow even further down during out-of-hours trading, discarding the better-than-expected results for Chinese manufacturing. Most stock market indices are set to take a breather this morning after yesterday's gains. Despite tough talk and the beating of drums in the run up to the European Union Foreign Ministers meeting, we didn't see anything more than a widening of Russian individuals on the naughty list. The inability of European Union members to rise above national self interest was taken as a bullish sign by markets as they realised that Europe wouldn't be throwing anything at Russia worth retaliating to; major indices had one of their best days for months. Having said that, Europe wasn't completely void of backbone, as tier 3 economy crippling sanctions are penned for discussion on Thursday and the door to punitive economic sanctions on the Russian economy still remains ajar. The odds of such sanctions being imposed is probably pretty low, but while they are still on the agenda traders will have to tread cautiously. With inflation in the US remaining in check, markets speculated that interest rates will stay low for longer. At the same time, corporate earnings topped estimates so investors felt confident enough to take on more risk, pushing the Dow Jones 53 points higher to 17,096. Cautious cues from Asia are leading European equities lower this morning. Despite US markets closing with modest gains yesterday, the positive sentiment doesn't seem to be catching. Given that there's not been anything particularly bearish to trigger the reversal in sentiment, it's quite worrying that the bulls have already run out of steam, especially when we've only recovered a fraction of last week's losses. This week has seen some positive economic data, good corporate earnings and major central bankers generally sticking to their accommodative approach; if the bulls can't rally on that then you have to wonder about the overall health of the market. The much awaited US Beige Book report indicated strong consumer spending together with expansion in the manufacturing sector. At the same time, Federal Reserve Chair Janet Yellen said that asset valuations 'are not out of line with historical norms'. The news encouraged American investors to stay confident so they pushed the Dow Jones to a record close of 17,116, up 43 points for the day. With Chinese GDP coming in just above expectations, we are set to see European stocks edge higher on the open. Traders are breathing more easily as it seems that the wobbles in the Chinese economy are just that, and for now at least investors are content with a stable growth rate from the world's second largest economy. Despite the positive open, UK spread betting markets are a little more jittery ahead of some key unemployment data. Yesterday's surprise rise in inflation caused all the hawks to chirp up about an early rate hike. If today's unemployment data compliments that view point by surprising to the downside, then expect their calls to reach deafening levels. Mark Carney has always stressed that monetary tightening will be 'driven by the data' so expect market sentiment to be derived from how long or short the dole queues are. Better-than-expected results for the US banking sector surprised the markets yesterday, triggering a rally led by JP Morgan Chase and Goldman Sachs. In addition, the economic outlook was aided by resilient retail sales figures. As a result, the Dow Jones gained another 20 points to close at 17,073, and investors will be interested to read through tonight's Beige Book report for the latest details on the state of the economy. The bargain hunters were out in force yesterday and anything that was at a knock down price after the recent falls has been snapped up. The Wall Street index rebounded by 84 points to close at 17,052 as Goldman Sachs predicted that the equity rally will continue. For now, it seems that concerns over financial stress in Europe have failed to spread to US markets, which have remained optimistic about the current corporate earnings season. Despite the gains, European traders are taking a little breather this morning ahead of UK CPI data and the German ZEW survey, with stocks set to open flat as we wait to see how sentiment pans out. UK inflation has been slipping recently and another weak reading should assuage concerns of an imminent rate hike. Likewise, the steady flow of weakening data from Germany is expected to continue. You could be forgiven for thinking that this would be bearish, considering that they are the only country keeping Europe afloat. However, if it spurs the ECB into even more extraordinary measures, then the markets will probably work its 'bad news is good news' magic and take it as a positive. We will also see Mark Carney testifying before the House of Commons Treasury Committee today, with Janet Yellen testifying before the Senate Banking Committee this afternoon. Whilst neither of them are immune to making market moving school boy/girl errors, the odds seem to be in favour of them remaining dovish for now. Bargain hunters are finally expected to make an appearance this morning, meaning that European equities are set to edge higher on the open. After a pretty gruesome week, which saw major European indices touch levels not seen for a couple of months, traders have taken the weekend to calm down. It seems that they have decided that the recent run of bad economic data and the flaring up of the Eurozone crisis isn't a sign of the long awaited 'correction'. Whether or not they are correct is something that will have to be seen and, despite this morning's positive open, it's going to take some serious effort on the part of the bulls to take back the lost ground. Financial stress in Portugal kept the US stocks under pressure during Friday's session on concerns of a spill over into the wider Eurozone. However, the trend reversed course on the back of positive economic growth prospects raised by rallies for eBay and Amazon. As a result, the Dow Jones finished the day 43 points higher at 16,953 and is still going strong this morning.